What is your job in Oz? You're in a field of poppy flowers. What do you do? You finally get an audience with the great Wizard of Oz. What does he look like to you? 1. (Easy) Who played Dorothy Gale(From Kansas)? 2. (Easy) What was one song that was cut from the film? 4. (Easy)What was it that took Dorothy to Oz? What color is Cheshire Cat? How well do you know Tim Burton's Alice In Wonderland? What is the name of the monster Alice had to slay at the end of the movie? What color is Alices Hair? Find out what magical creature you are, so you can esacpe the mundane reality. Discover your own magical identity, good or evil. Where is ur dream home? 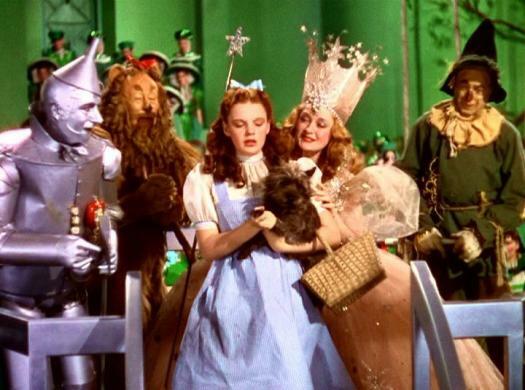 Who is your favourite character in The Wizard of Oz (1936) Movie? In "The Wizard Of Oz", what did the sign read on The Emerald City door? When a tornado rips through Kansas, Dorothy (Judy Garland) and her dog, Toto, are whisked away in their house to the magical land of Oz. This is a quiz about The Wizard of Oz movie. Can you score a perfect? In the movie "Wizard of Oz", what other character in the movie has an Auntie Em? Are you a fan of fantasy and fiction books and movies? There is so much to explore in these genres and now it's time to test that knowledge. Bring it on! Who is considered to have the biggest influence and popularization of high fantasy genre? Wasn't the movie lovely? Let's see now how much do you know about it! The cowardly lion’s costume was made of a real lion skin. What fantasy are you?Have you ever wondered about being a mermaid or have fire breath like a dragon.Do this quiz to find out! Which Fantasy Personality Is Most Like You? Are you a nerd? Or just obsessed with fantasy? Take this quiz to find out which (humanoid) fantasy creature's personality is most like you! You have one twenty dollar bill left in your wallet, what do you spend it on? I'll buy a whoopy cushion and some fake blood! "I'll give you $20 to drink out of my toilet!" Ever wonder how you might do in a fantasy story? Take the test to see where you might fit in! You're at work with a few friends, when the boss approaches. He yells at the group for slacking off and threatens to fire you. He doesn't have the right to yell at you! Tell him what for. Listen closely, he might say something invalid that you can use against him. Remind him that you know where he lives. Whatever. You don't care if he fires you. He can't talk like that to your friends! Back them up. What is dorothys full name? Which Fantasy Land Should You Travel To ? I suppose they might, but it really doesn't matter. Which Fantasy Sub-genre Is Best For You? If you're a fantasy lover, take this quiz to find out more specifically what sub-genre you most relate to. Which of these is your idea of a great day? Discussing with the elves the upcoming war between the dwarves and the unicorns in the elf language. Meeting a handsome werewolf in a dark alley. Traveling back in time to meet your great-great-grandma. Having dinner with the rabbits and talking politics. Walking through the forest with Hansel and Gretel. Which Fantasy franchise do you like? What weapon would you choose if you had a choice? Going over the edge for Jack and company! Where do our heroes go to rescue Jack? This quiz is based on your subconsious associations. It is not objective! All you need is your imagination. You will need a pen and paper for this test or you can memorize your answers. Imagine yourself entering a White Door. Describe the door.what does it look like, where is it? What is made out of? Is it easy to open? And finally, what is behind the door? How do you feel, are you comfortable or uneasy? Is there anybody behind the door: people, animals, mythical creatures? Do you like them, or do they maybe make you feel scared? I want to explore a different door. Find out which fantasy sub-genre most appeals to you, with recommendations for authors and books to explore! What first comes to mind when you think of "fantasy"? Special creatures with special powers: witches, vampires, dragons, etc. Which of these is not a character in FF7? What Do You Know About Fantasy? Here is a test to evaluate your knowledge of fantasies. They are fantastic and intriguing, yet you know little about them. Here is an eye-opening quiz. Who is the first known person to study fantasy? What Does Your Slave Mistress Look Like?